Italy has provided our great country with beautiful Lamborghinis, Ferraris, and designer clothing, so it is only fair that in return we provide them with the best Rock and Roll the U.S. has to offer! Green Bay's very own Beach Patrol is in fact packing their bags right now and getting ready to rock it over seas! The Title Town power pop Quattro has partnered up with their Italian over seas label Wild Honey Records on a 17 show tour all around Europe, not to mention they need to make it through the first 13 shows before they get a day off! So you might be asking yourself "If Italy knows about these guys, how come I don't?" If you have no answer to that question then you need to stop watching those Two and a Half Men episodes and maybe get out for a night. The sonic waves that Beach Patrol sustains is of really loud rock and roll. Now this music did not come from my generation, nor do I know who started this wild craze of cranked guitars and catchy hooks, but I won't be fooled again into thinking this music is from the 60s. In fact there has been a series of kinks in the road of the development of power pop, one of which I can hear a little influence of mod and maybe some motor city Motown in the overtones of this overly amplified rock group. 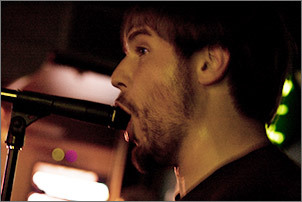 Front man Domenic Marcantonio belts out the soulful vocals loudly, his lyrics are of a common self perspective with personal insight on normal everyday life. Domenic's Fender tele guitar has a nice jangly sound and turned way the heck up, mashing through the power chords and riffs! On bass, Jeff VanDreel's tone was rubbery and retro; I like the fact that he's blending some scales and riffs, through some rather straight forward progressions. Preston Ely has plenty to keep him busy through out the set, the songs are mostly up beat, except the extra gritty tunes on "Windy City." Ian Olvera's key boards and guitar really rounds out the sound with the addition of roto organ parts. 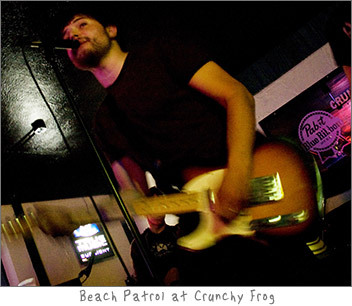 Beach Patrol were the head liners at this Crunchy Frog Euro Tour Send off show and the ramp up bands were great. Tim Schweiger and the Middle Men are on my must see again list for sure. All and all a great show that could have used a little more light and PA but the most important element was there, great bands, and that is worth cover. Catch Beach Patrol in Europe and then returning back to the States in June. After they recoup from the Euro tour I'm sure they will get back to rocking it out in Title Town! Check out beach Patrols new CD "Riding Dinosaurs" Available locally and on CDBaby!